A few weeks ago, we all became aware that Special Counsel Robert Mueller has spent the past couple months pushing the courts to compel someone to comply with a grand jury subpoena. The person’s identity is top secret, and the legal battle itself has been given unprecedented priority by the courts. Numerous legal experts suspect that Mueller is trying to force Trump himself to testify before a grand jury. In any case, Mueller just made a major new court filing in the matter. Robert Mueller’s new filing is three thousand words long, and for better or worse, we can’t see what it says, because it’s under seal. But the most important clue here is the timing. Donald Trump keeps telling reporters that he’s finished answering Mueller’s questions in writing, while adding that he hasn’t turned them in yet. The question is why he’d do it this way. One of the most plausible explanations is that Trump and Mueller were both waiting to see which way the courts rule on this matter. If Trump is ordered to testify before a grand jury, then his written answers may be irrelevant. If the courts side with Trump, then Mueller will have to accept his written answers and nothing more. But here’s the kicker: shortly after Mueller made this filing, Trump’s legal team told ABC News that they’ve preemptively submitted Trump’s written answers to Mueller. This could be a last ditch effort at appeasing the court and preventing it from siding with Mueller. Earlier this month, thanks to a legal challenge, the long-secret roadmap was revealed for ousting Richard Nixon, which never was carried out because he resigned. That roadmap showed that Special Prosecutor Leon Jaworski was planning to have a grand jury conclude that Nixon should be indicted, and then turn those findings over to the House for impeachment proceedings. If Robert Mueller is following this roadmap, there is every reason to believe that he’s trying to compel Donald Trump to testify before a grand jury that is then going to turn around and declare that he should be indicted. Trump could try to plead the Fifth, and that may be his current argument in court. But the bottom line is that something big is secretly going on in court right now between Mueller and Trump that could end up dictating how everything else plays out. 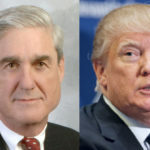 It’s also notable that, while we can’t see the contents of Robert Mueller’s new filing today, the sheer length of the document suggests that Robert Mueller is moving forward against Donald Trump full steam ahead, without any meaningful interference from illegitimate Acting Attorney General Matthew Whitaker. This comes one day after another Mueller court filing, against Roger Stone associate Andrew Miller, suggested the same thing.